The republic is located in Western Europe, from the west it is washed by the Bay of Biscay between Belgium and Spain, from the north via the English Channel it borders with Great Britain, from the south it is washed by the waters of the Mediterranean Sea, between Italy and Spain. The main administrative and political city of Paris. The flag is a tricolor of three vertical stripes - blue, white and red - conveys the three main ideas of the French Revolution - freedom, equality and fraternity. The modern coat of arms became a symbol of France after 1953, although it has no legal status as an official symbol. 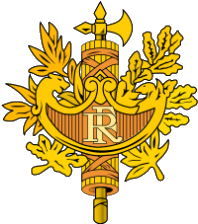 It is the shield of the left side, ending with the head of a lion, and with the right head of an eagle, in the middle is placed the monogram “R.F” which means - French Republic. The shield is decorated with an olive branch symbolizing peace and oak symbolizing wisdom. Behind the shield is a fascia representing a bundle of elm or birch twigs (an attribute of higher magistrates). An ax is fastened in the fascia - signifying the right of magistrates to judge or favor. The population is 64,859,773 people (as of 1997) and, taking into account overseas territories, 66,991,000 people. The official language of the state is French, the majority of the population speaks it. 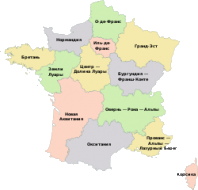 France is divided into 18 regions, 12 of which are on the European continent, 1 (island Corsica) and five overseas. In total, there are three types of climate: oceanic (in the west), Mediterranean (in the south), continental (in the center and in the east). 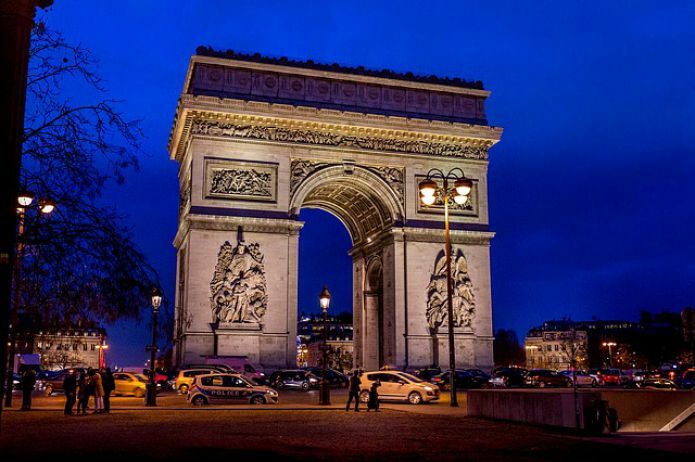 France is the first tourist destination in Europe, and this should not be surprising, because France is a country that has many tourist attractions, monuments, historical and other places. France is widely known for its wines and cheeses, which encourages many to go on a gastronomic tour. Among European countries, France has a surprisingly diverse natural environment - it extends from Normandy to the vast hilly landscapes of Champagne de Boz, alpine peaks, northern spruce forests or to dry bushes of the Mediterranean - not to mention the arid highlands or a diverse coastline bordering the Northern Sea , La Manche, the Atlantic Ocean and the Mediterranean Sea. It would take an entire encyclopedia to compile a complete list of all natural tourist sites and thousands of other natural sites in France. The country has six national parks, 43 regional parks, hundreds of areas included in the list and protected by the official European program Natura 2000. In France, there are more than 100 amusement parks, including parks of all categories such as Disneyland Paris, or animal parks and aquariums, as well as ekomusei such as the large eco-museum of Alsace. France has fifteen elements included in the UNESCO Intangible Cultural Heritage List. Maloya is music, singing and dance created by slaves from the Madagascar core. France is known worldwide for its "gastronomy", its restaurants and good wines. Foreign tourists are often surprised to find that they can find very good quality restaurants in small provincial towns, and that many of these restaurants offer first-class menus for a fraction of the price that would be paid for something like that at home. There are several guides who approve and list the best restaurants, the most famous of which are the Michelin Guide and the Guide by Gaulle Millau, but there is no directory that lists all the good restaurants in France, because there are so many of them. On the other hand, some are far from tourist flows, these are simple village or small village restaurants, whose cuisine, although it is tasty, well prepared and nutritious, is not necessarily considered "high gastronomy". With the onset of cold weather in France, winter dishes return to the menu. It is probably the greatest success with the French.